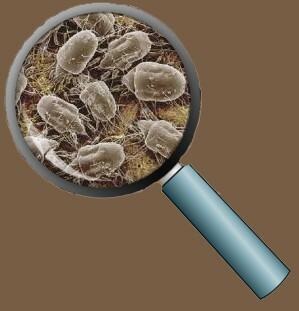 Dust mites are tiny insects approximately .03mm long and are the most common cause of allergies from house dust. Dust mites can be found in almost all areas of your home including: mattresses, pillows, quilts, carpet, upholstered furniture, drapes and clothing. They float into the air when anyone vacuums, walks on a carpet, or disturbs bedding, then settle in again afterwards. They feed on dead skin cells that are shed by people and pets throughout the day, and they thrive in warm humid environments. There can be hundreds of thousands of dust mites in your mattress with a lifespan of 50 – 150 days, during which time females lays hundreds of eggs. 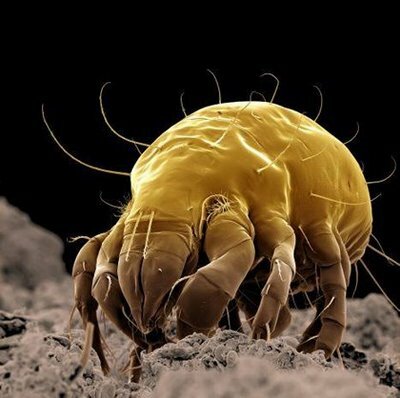 Humans are not only affected by the dust mites themselves, but also from proteins in their droppings which can trigger allergies. If you are feeling overwhelmed with allergies and believe they are caused by dust mites in your home, give Stutters DKI a call. Our highly trained technicians and professional equipment can thoroughly clean your home, removing dust mites from your living room and bedrooms, including upholstered furniture, beds, carpets and drapes. Keep Your Home Well Ventilated – Open windows and screen doors to allow fresh air to circulate and reduce the dust mite population. Buy Washable Stuffed Toys – Wash the stuffed toys often in hot water and dry thoroughly, or switch to plastic toys. Have Your Carpets Professionally Steam Cleaned – Steam cleaning dissolves dirt and grime, removes germs from surfaces, and kills dust mites. Vacuum Regularly With (HEPA) Filter – Vacuum everything possible, including carpet, furniture, mattresses, chairs, coach and floors. Get underneath and behind furniture to keep “dust bunnies” (A.K.A. “dust mite motels”) from forming. Cover Your Bedding – Put airtight plastic dust-mite covers on mattresses and box springs. Wash Bedding Weekly – On a weekly basis wash all sheets, blankets, pillowcases, bed covers and other bedding with detergent in hot water at its hottest setting to kill dust mites and remove allergens (this will also help with bed bugs if they are an issue). 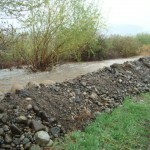 High water temperature can kill dust mites better than just using detergent. Use a hot tumble dry on items for an extra half hour after to help kill the remaining dust mites. Regularly Dust Your Home – Use a damp mop or cloth to dust your home at least once per week, the dampness will prevent dust from becoming airborne and resettling. Cut Down On Clutter – Keep your favorite items, ornaments and books to a minimum – especially in bedrooms. Buy Washable Curtains – Use light washable cotton curtains, and wash them frequently. 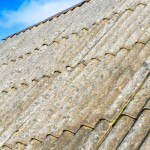 Reduce Humidity – Increasing ventilation in your home will also help reduce humidity. Open windows daily and use extract fans in bathrooms and kitchens when necessary.